ufw – Used by Ubuntu and Debian based system to manage the firewall. firewalld – Used by RHEL, CentOS and clones. It is a dynamic solution to manage the firewall. The author of the tutorial recommends that you run the software firewall even if you have a hardware-based firewall. Do not disable firewalld/ufw as it protects the individual server/VM. 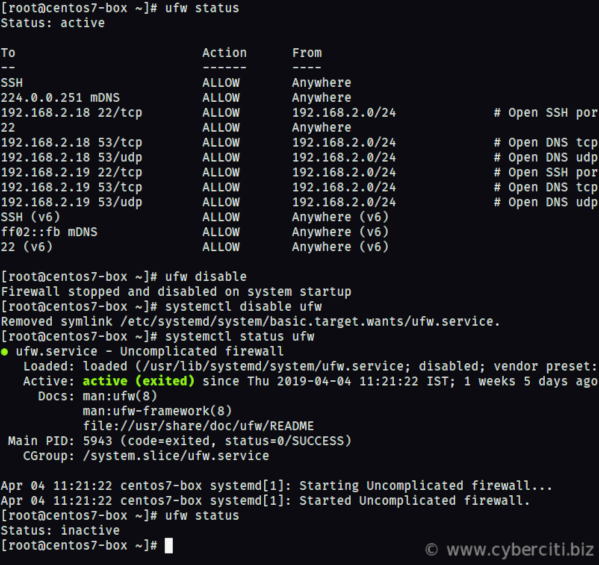 Let us see how to stop and disable Firewalld on a CentOS or RHEL 7.x based system. Is firewalld running on my system? Apr 09 13:54:24 nixcraft-nuc systemd: Started firewalld - dynamic firewall daemon. 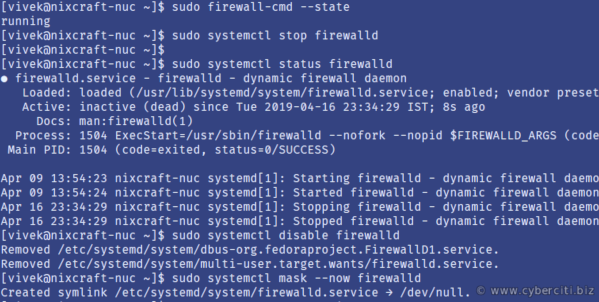 Apr 16 23:34:29 nixcraft-nuc systemd: Stopped firewalld - dynamic firewall daemon. How do enable the firewalld again? ufw is easy to use app for managing a Linux firewall and aims to provide an easy to use interface for the user. It is the default on Ubuntu and can be installed on Debian, CentOS, and other Linux distros. How do enable the ufw again? See “How To: Disable Firewall on RHEL / CentOS / RedHat Linux” for more info. In this page, you learned how to stop and permanently disable the firewall on a Linux based operating system using various command line options.